The remaining ruined wall of Castle Conway, Killorglin, Co.Kerry. 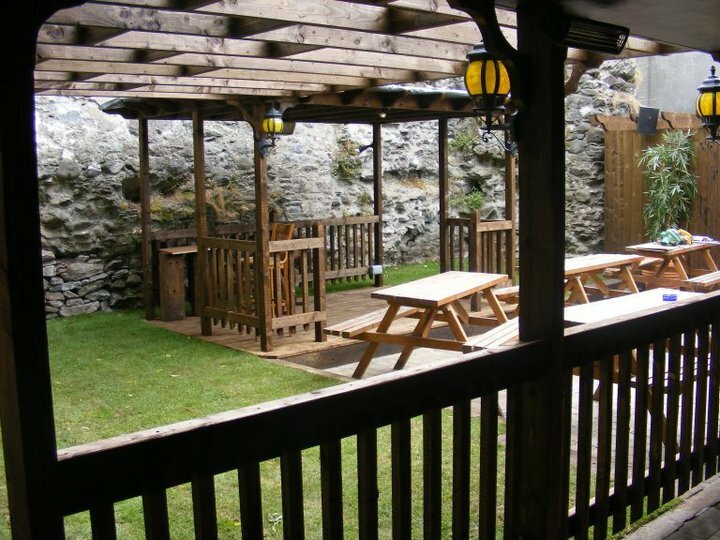 Now in a beer garden. mar 2ndly to Rev. Arthur Herbert. Mary Collis, mar John Spring. Martha Collis, mar John Gun. Alice Blennerhassett, mar her 1st cousin Thomas Hurly and had issue. mar 2ndly, 9th Feb 1731 (think NOT Aug) to Maurice O'Connell and had issue. Henry Blennerhassett, of Gortmasherry, Co.Kerry, born est c.1675. Elizabeth Mason, mar 1760 to Dr. Robert Emmet and had issue. John Mason, mar Jane Hurly. Avice Blennerhassett, mar Thomas Spring and had issue. Alice Blennerhassett, mar Walter Spring and had issue. Mary Poujade, mar Henry Blennerhassett and had issue. Anne Blennerhassett, mar 1701 to Dennis Hurly and had issue. Gerald O'Carroll points out this snippet about the Cromwellian war (1649-53). This is from a long item by John T. O'Flaherty in the Tralee Chronicle, 4 April 1846, p.3. 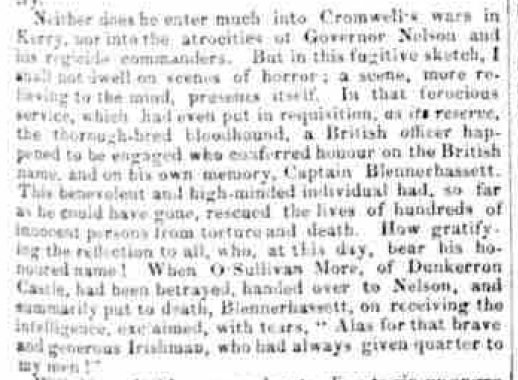 "In that ferocious service ... Captain Blennerhassett ... [a] benevolent and high-minded individual had, so far as he could have gone, rescued the lives of hundreds of innocent persons from torture and death. ... When O'Sullivan More, of Dunkerron Castle, had been betrayed, handed over to Nelson, and summarily put to death, Blennerhassett, on receiving the intelligence, exclaimed, with tears, "Alas for that brave and generous Irishman, who had always given quarter to my men!"" "Governor Nelson" is John Nelson, the ruthless Cromwellian Governor of Kerry and Desmond from 1652 to 1658. Gerald O'Carroll says "Captain Blennerhassett" is the Cromwellian Capt. Robert Blennerhassett. Which O'Sullivan More was killed is not clear.